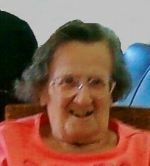 Obituary - Rita Esposito - Bentz Funeral Service, Inc.
Miss Rita Esposito, 96, of Utica, passed away Thursday January 3, 2019 at the Masonic Care Community. She was born November 30, 1922, in Utica, the daughter of the late Augustino and Almerinda Graniero Esposito and was educated in Utica schools. For many years she truly enjoyed her job as bookkeeper for the Utica Public School System. She is survived by numerous nieces, nephews, great nieces and great nephews. Miss Esposito was predeceased by two brothers, Dominick and Harry Esposito; and seven sisters, Lena Critelli, Elizabeth Campisi, Mamie Rich, Mary Esposito, Florence Esposito, Jenny Russo and Margaret Garcia. Rita found great pleasure in going to the casino (when Jay would let her), scratch offs that Sharon was so kind to bring in and visits from her family. She particularly enjoyed the visits and kindness from her friends, Sabina Case and Dolores Szczygiel. Services will be held Wednesday at 2 pm by Rev. Arthur Krawczenko in the Meditation Room at the Masonic Care Community. Private interment will be in Calvary Cemetery. Miss Esposito was very appreciative of the many friends and care givers who truly were family to her at the Masonic Care Community, especially Josephine and Bob, Paula, Sharon, Aida, Kathy, Elise and Ramoo. Arrangements are with Bentz Funeral Service, Inc., New Hartford.